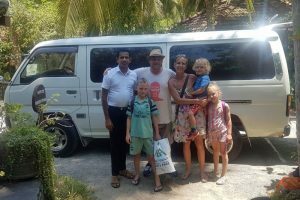 Sanju drove us from Ella to Mirissa with a stop at udawalawe and the nationalpark, which he also helped us book. The day after the safari he picked us up at perfect time and drove us to Mirissa. We really enjoyed the car that was clean, seatbelts for everyone, wi-fi, bluetooth! Sanju was a really good driver that made us feel safe in traffic and very serviceminded! We will recommed him to out friends!